Following on from last year's brilliant teaser, Aardman Animation's upcoming sequel to the Shaun The Sheep Movie's full trailer has arrived. And this time, we've got our first look at actual footage from the film itself. The teaser introduced an unexpected sci-fi element to Shaun's world, with the arrival of a UFO. 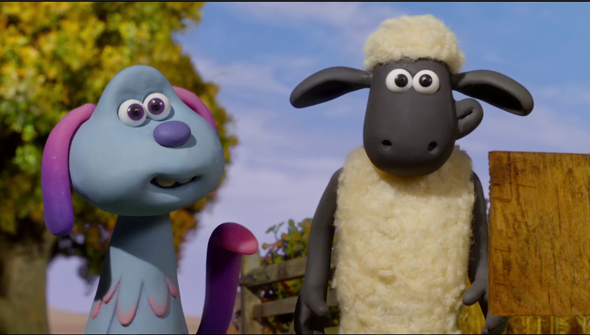 In the full trailer, we learn that Shaun and his flock will befriend an alien, named Lu-la. Based on our first look, it looks like this new character is another classic Aardman character. Mischievious, cute as a button and endlessly curious, she looks like the ideal foil for our favourite woolly hero. Shaun and friends have to try and keep Lu-la's existence a secret and go on the run from the authorities, with a "sinister alien-hunting agency" on their tail. We see a glimpse of a woman in Men In Black style clothing who presumably will act as the film's lead antagonist. Can Lu-la get back to her ship before it's too late? The trailer uses a classic trailer-style voice-over (a rarity these days) which is a pretty strong indicator that this is going to, like its predecessor, be largely dialogue-free. The trailer is full of classic Aardman moments, with fabulous sight-gags and incredible attention to detail- along with obligatory nods to ET. Aardman have never let us down, and it doesn't look like that's going to be changing any time soon. A Shaun The Sheep Movie: Farmageddon will arrive in UK cinemas on October 18, 2019. via StudioCanal. Lionsgate will release the film in the United States on December 13.